By buying this product you can collect up to 2597 bonuspoints. Diesellok klass 100 typ Köf II GDR, loket har digitaldekoder och ljudmodul, telexkoppel, längd över buffertar 7,4 cm, epok IV. Prototype: Köf II small diesel locomotive as the German State Railroad (DR of the GDR) class 100. Version with an enclosed cab, large DR lamps, two compressed air tanks, and an oil bath air filter. Road number 100 801-0. The locomotive looks as it did starting in 1976. Model: The locomotive has a digital decoder and extensive sound functions. 2 axles powered. It also has Telex couplers front and rear that can be controlled separately in digital operation. The triple headlights and dual red marker lights change over with the direction of travel, will work in conventional operation, and can be controlled digitally. The headlights at Locomotive Ends 1 and 2 can be controlled separately in digital operation. When the switching range is activated or when the headlights at both ends are turned off, then the 'double A' light function is on. The locomotive has separately applied metal grab irons. Length over the buffers 7.4 cm / 2-7/8'. Highlights: First time with extensive sound functions. Telex couplers front and rear. Köf II for the first time in a DR version from Trix. 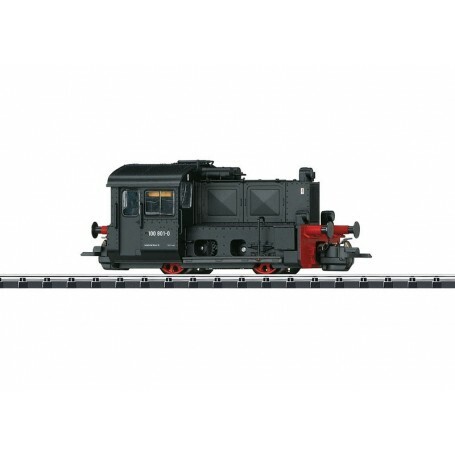 This model can be found in an AC version in the Märklin H0 assortment under item number 36814.